Most children in South Africa learn their school subjects in a language that is not their home language. This puts a barrier between the child and the subject he’s studying, and also makes the teacher’s job harder, as she tries to help children understand their textbooks and write successfully in their additional language. 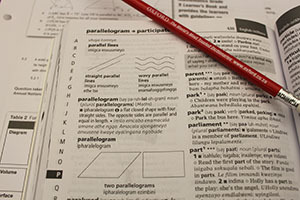 Teachers address this common problem in different ways: They ask children to explain to one another in their home language the meaning of key terms; they act as “walking dictionaries” – translating words that learners are struggling with; they code-switch (move from one language to another) in their teaching; they create multilingual wordlists; they use diagrams. They do these things because often they don’t have the resources they need, or the resources they’d like don’t yet exist. This situation could change for the better with the 2014 publication of the Oxford Bilingual School Dictionary: isiXhosa and English. “I am so pleased to find so many of the terms and concepts we use [in the dictionary]”, says Karin Sauls, Senior Phase Subject Advisor in Economic and Management Sciences in the Department of Basic Education. She was reviewing the new Oxford Bilingual School Dictionary: isiXhosa and English, which includes 433 key curriculum words chosen from an analysis of core textbooks including maths, social sciences, life orientation and languages. The entries for these curriculum words offer more support than other entries – they offer a definition (or explanation) of the word in both isiXhosa and English, as well as a clear translation. Some entries also include an illustration, such as at rotate. Almost all offer children an example sentence, chosen specifically to show how the word is used in a sentence. Using new words remains a key area of difficulty for most learners of a language, making example sentences one of the most popular dictionary features.